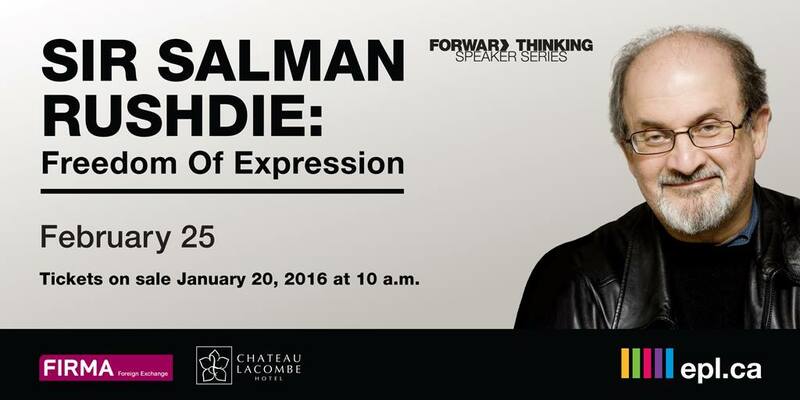 ”To celebrate Freedom to Read Week, EPL will welcome Sir Salman Rushdie as part of the Forward Thinking Speaker Series on Thursday, February 25th. Sir Salman Rushdie is one of the most celebrated authors of our time. A brilliant provocateur, he’s penned a handful of classic novels, influenced a generation of writers and received a Queen’s Knighthood for his service to literature. In line with EPL’s new approach to ticketing, seats will go on sale at 10am on Wednesday, January 20th for $10 with all proceeds going to support the Stanley A. Milner Library revitalization project. VIP tickets will also be available for $150 and will include a premium seat and a private hors d’oeuvres reception with Sir Salman Rushdie following his presentation. We will be headed to The Hat on Jasper ave afterwards, we do have a small reservation so please reply on the event listing and let us know if you are planning on attending so we can increase the reservation numbers. Will anyone be going from the University of Alberta campus area? I don’t have a car so I would love to carpool. Thanks! Has anybody got 2 extra tickets? Please email me.